You are currently browsing the category archive for the ‘Ubuntu’ category. Install cacti via aptitude as per usual, loads of guides out there for that; configure it etc. can even add hosts. It doesn’t break anything, so this can be an upgrade on a current running system. Install that locally, you’ll then need to follow the upgrade process via the browser again. Be careful if you used cactid rather than the php script you’ll need to make sure it’s not looking for spine (the new cactid name) which hasn’t changed as of yet.I simply modified the path in the config to point at the current cactid binary file. Then untar the plugin-arch tarball to the /usr/share/cacti/ directory and copy the directory within and the patch file into your /usr/share/cacti/site directory and follow the details on the cactiusers.org page to patch them, note do not overwrite files as this totally messes up the changes Ubuntu has made to the Cacti package. The patching proces changes that to $config[‘url_path’] = ‘/’; which means all the graphics disappears etc. which is obviously not good ! That should be it… one thing to note is so far the CLI tools for cacti are not in the Ubuntu package. Dead simple to add these. Just download the 0.8.7a tarball from cacti.net and extract it somewhere. Inside it is a cli directory, that can be just copied into the /usr/share/cacti/site folder and you can add graphs, hosts etc. via the CLI tools. Restart Firfox and now you’ll be able to click on a DivX file and it will play properly. I also like to know where the ISS is. I love the chart they have in Mission Control plotting its course along the Earth. It’s pretty cool to think if you look up now and conditions are right you might catch a bright star like object crossing the night’s sky. Well here’s how you can using Kubuntu/Debian. First off we need to install KTrack and a couple of extra packages to get up and running. Note there is a bug with the current ktrack package in Ubuntu/Debian that does not properly resolve dependancies. The libhamlib-dev package needs to be entered manually to get around this otherwise it’s going to be crash city for ktrack. Xplanet adds the nice background 3D worldmap. NOTE: This was edited as I since discovered a bare text file which didn’t require any sed work.. oh well ! I’m not sure how often this file is updated, but doing it daily should catch it (It’s most likely weekly), and it’s a tiny file so they won’t exactly be swamped by the bandwidth usage ! 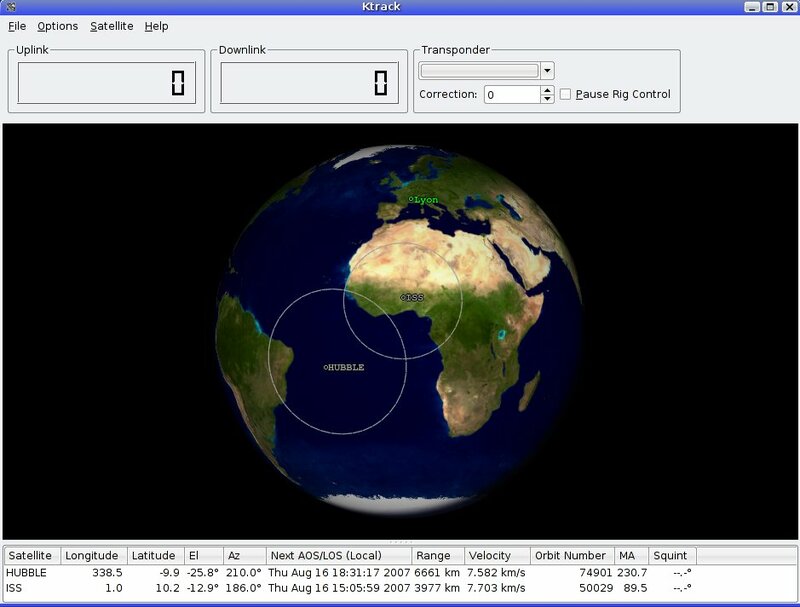 Now all you have to do is set your location when you start up KTrack, select the satellite ISS in the selection menu and make sure you turn on XPlanet in the Options… and if you fancy set it as your wallpaper. EDIT: In case anyone wants it, here’s the previous version of the script to strip out the satellite info from the non bare file.